from Preserving by the Pint by Marisa McClellan. 1Scrub the lemons, slice off both nubbly ends, and cut each into 6 wedges. Lay each wedge on its side and slice off the thick piece of membrane that runs down the middle of each lemon, along with any seeds. Place these bits into a square of cheesecloth, gather it into a bundle and tie with kitchen screen. 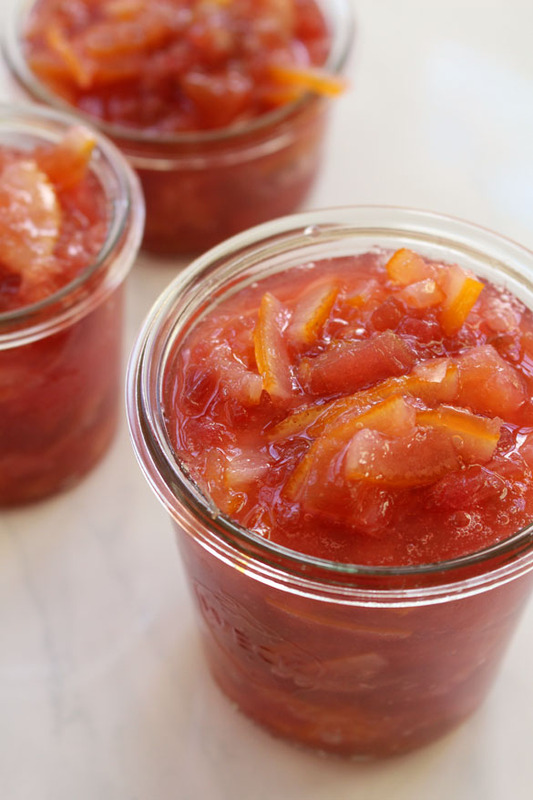 (This will provide pectin to help your marmalade gel.) Put the lemon slices and the bundle into a bowl with 2 cups of water and pop into the fridge overnight. 2When you're ready to make marmalade, put the lemon mixture (including the bundle and water) into a pot along with the sugar and bring to a boil. Simmer for 20-25 minutes. If you have a candy thermometer, it should reach 220F - but I've been without one for awhile, and mine set beautifully. To be honest, I didn't even time it that accurately. 3Add the rhubarb and simmer for 5 minutes until it softens and turns your marmalade a pretty pink. Divide into clean, hot jars and process if you like for long-term storage; otherwise, the marmalade will last in the fridge for at least a couple months, and can be frozen.